It’s sure been chilly and muddy here in southern Indiana for the last month, but the sun has finally decided to come out and show its shiny face the last few days. Alas, spring is just around the corner — I can feel it! To celebrate bluer skies and warmer temps, I’ve been inspired to create a few go-to color palettes that are perfect for some fun designs, with the help of Coolers. 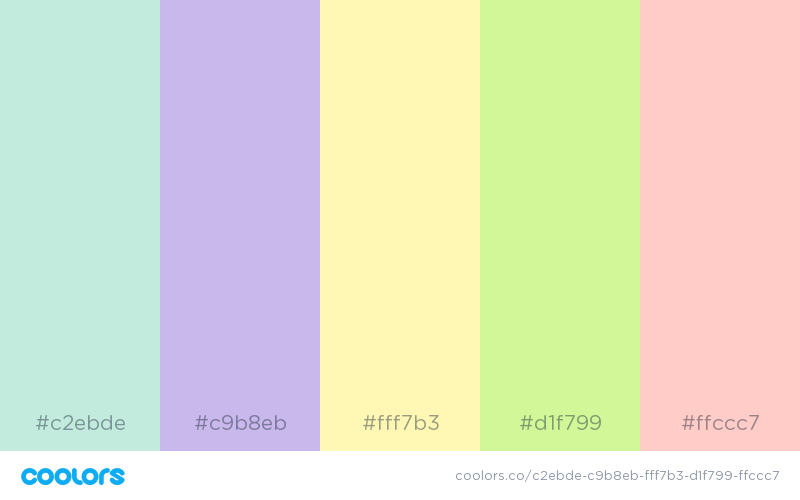 If you haven’t checked it out yet, it’s a great website that allows you to quickly generate palettes. 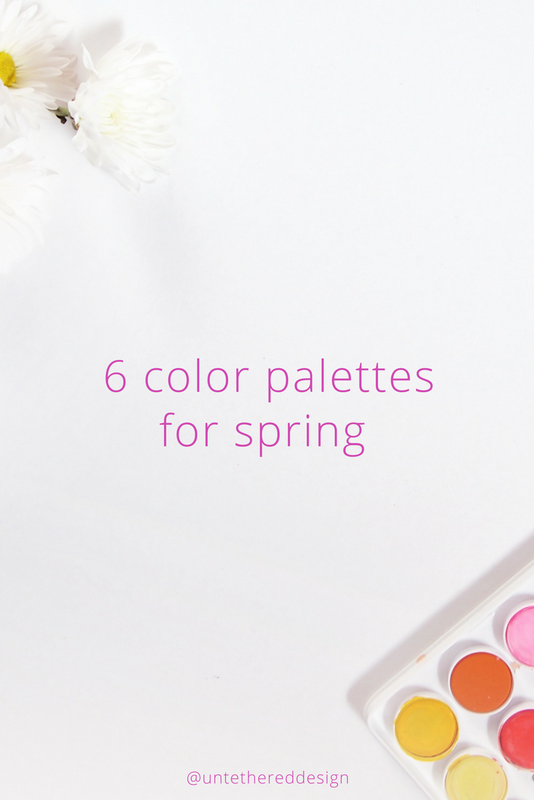 Whether you’re a bolder/brighter kind of person, you like the fresh and clean look and feel, or you prefer the traditional “Easter egg” pastels, there is a collection of swatches below, just for you. 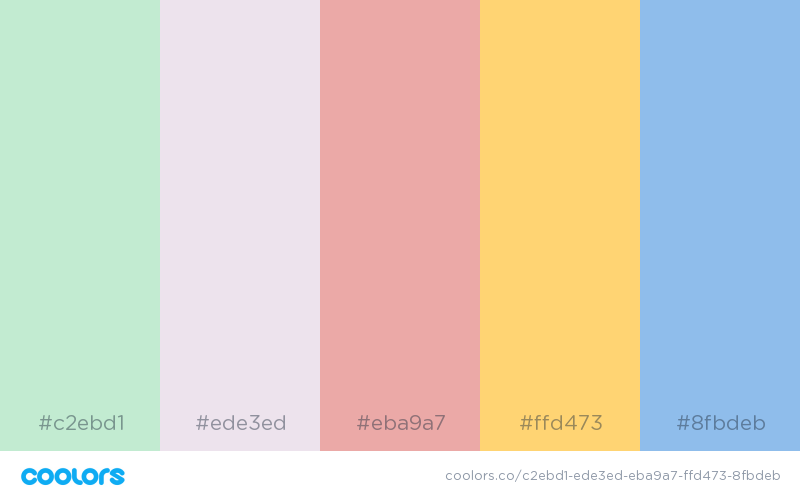 Feel free to use any (or a mix) of these for your own branding (if you like any of these color combos year round) or for a special spring project! Share this post with your fellow small business bosses and friends. 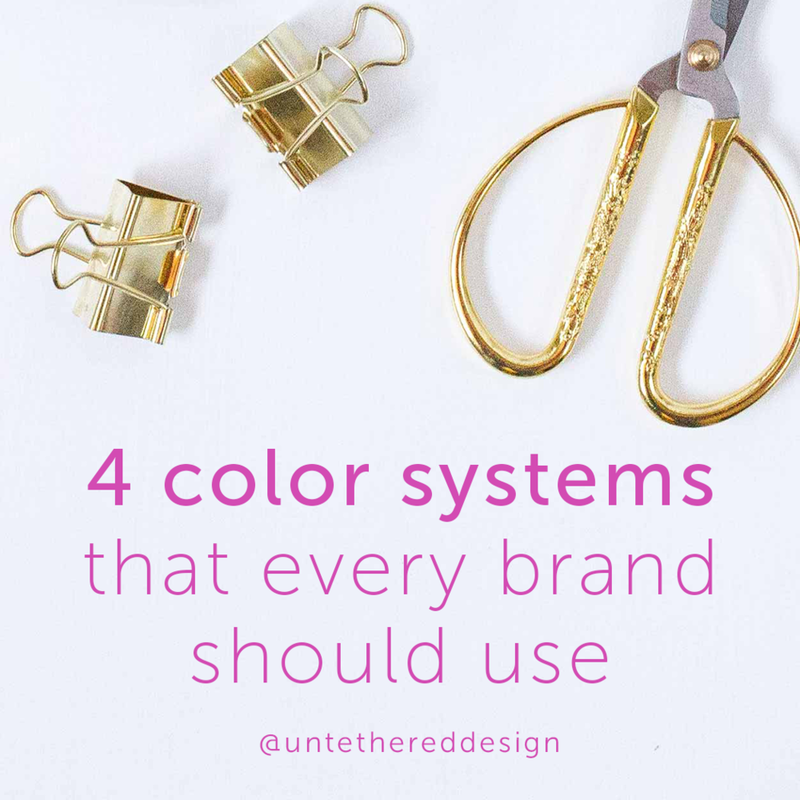 And, be sure to tag @untethereddesign on Instagram so that I can see your designs using my color palette(s)! Whether you’re using these for print or digital platforms, or a website/blog, I’ve provided the specific Hex codes for easy and quick references to start. 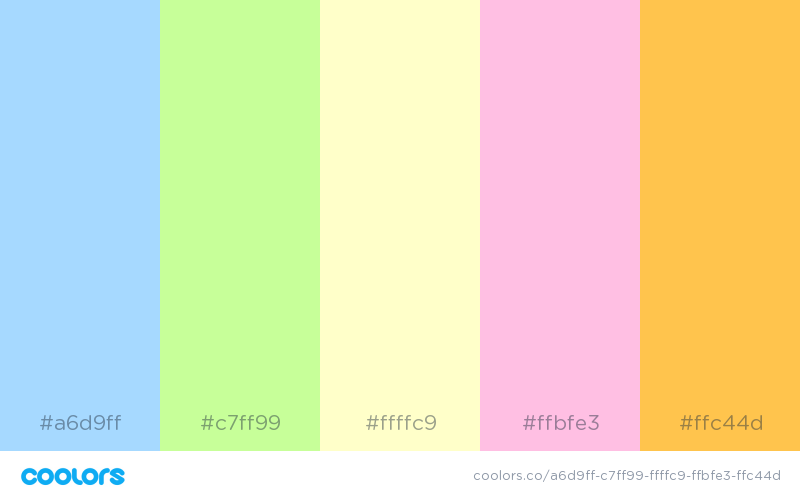 If you like a particular color, enter the Hex code (#xxxxxx) at Color-Hex, a website that will generate the other color codes (CMYK, RGB, etc.) for you. Just type in the code at the top and click “Get Info.” Voila! 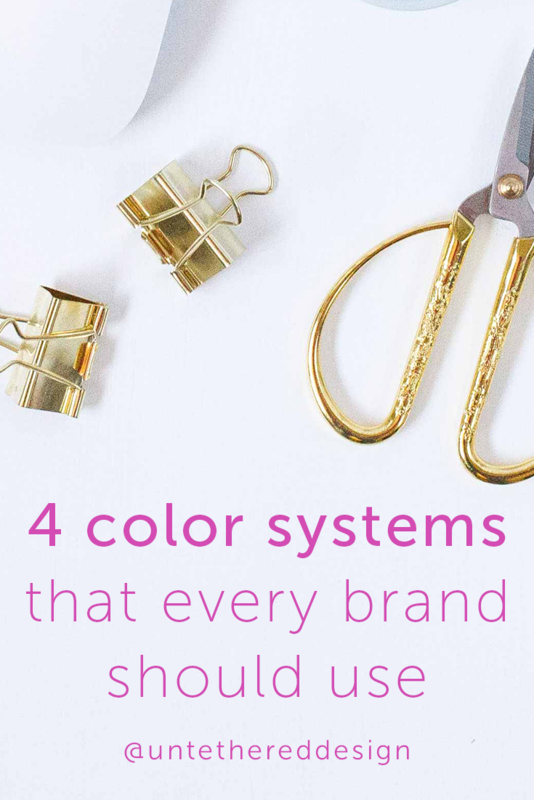 And, in case you need to remember the differences between each color system and when/where you need to properly use them, refer back to one of my latest posts that gives the exact breakdown! If you’re a small business owner DIY-ing your visual branding (your logo, website, business cards, social media graphics and more) or if you’re working with (or have worked) with a professional designer, it’s important to be familiar with some “designer lingo” from time to time. Have you ever heard someone reference “RGB” or “Hexadecimal” before and wondered, “what the heck is that?” You’re not alone. When it comes to design, understanding how colors work and effect a design in many ways is crucial. And, understanding that you need to design within specific color modes within specific platforms, in order for your design to be of the best quality and setup professionally, is even more crucial. The short and sweet of it is this — you must design using a different color system for print than you do for digital. If you’re preparing files to send to a printer (let’s say, your business cards, a brochure, or a banner) they will need to be “CMYK-compatible” for best results. Or, if you’re developing your website or designing a graphic for your blog or Instagram (images that will only be viewed on a screen, digitally) you’ll need to use the “RGB” format or even a “hexadecimal” code. RGB stands for red, green, and blue, which are the three additive primary colors. We use this system when designing something to be displayed digitally (think websites and social media graphics), but not to be printed. CMYK stands for cyan, magenta, yellow and black. This system is used in 4-color print processing, as these four are the standard inks for producing colors. When a file is sent to print, it must be setup in CMYK mode. PMS: The Pantone Matching System is a universal color matching system, also used in printing. Pantone colors are specific swatches that are already pre-mixed. So, if you use these colors in your design, they’ll print the same every time. This is important when you’re dealing with brand colors that need to be exact. A CMYK-based blue might print lighter or darker depending on the printer, but a Pantone-based blue should print the same from one printer to the next. Hexadecimal: I’ve never been a math whiz, so this one can be a little tricky. Although I don’t even (always) understand how the numbers work, this is a color code that you can use when developing a website and when you’re utilizing HTML or CSS code. Within this color system, digits (in pairs) indicate the red, green and blue components in the RGB system, mentioned above. The code uses sixteen distinct symbols and when working within CSS, the symbols “0–9” represent values zero to nine, while “A, B, C, D, E, F” represent values ten to fifteen. So, 3 pairs of Hexadecimal symbols are used. For example: Hexadecimal code: #fefafd is RGB: 254,250,253. Adobe InDesign: First, use this program for anything that you need to lay out and that will be printed (again, business cards, postcards, annual reports, booklets + more). Secondly, remember that you need to design these soon-to-be-printed materials in CMYK mode. To do this, open your “Swatches” palette. Click on the upper right-hand drop-down menu and select “Ink Manager.” If you’re using CMYK colors, the four of them should appear in a little window: “Process Cyan, Process Magenta, Process Yellow, Process Black.” You should also see CMYK values for each swatch in the palette (unless you’re using PMS spot colors, which is totally acceptable!) However, if any appear to be showing RGB values, simply double-click on the swatch, click on “Color Mode” and select “CMYK.” Before you export a PDF for printing, make sure that ALL of your swatches are setup in CMYK (or PMS options/spot colors.) 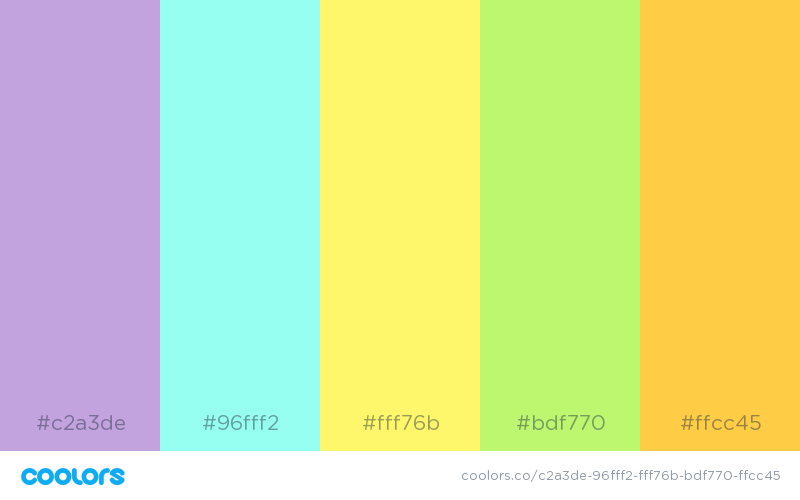 Either CMYK and/or PMS (Pantone) is what you want your swatches set in before finalizing your design document. Speaking of PMS swatches, where do you find those, you might be thinking? Simply go back to your “Swatches” palette, click again on the upper right-hand drop-down menu, select “New Color Swatch” and you’ll see multiple Pantone options to choose from. 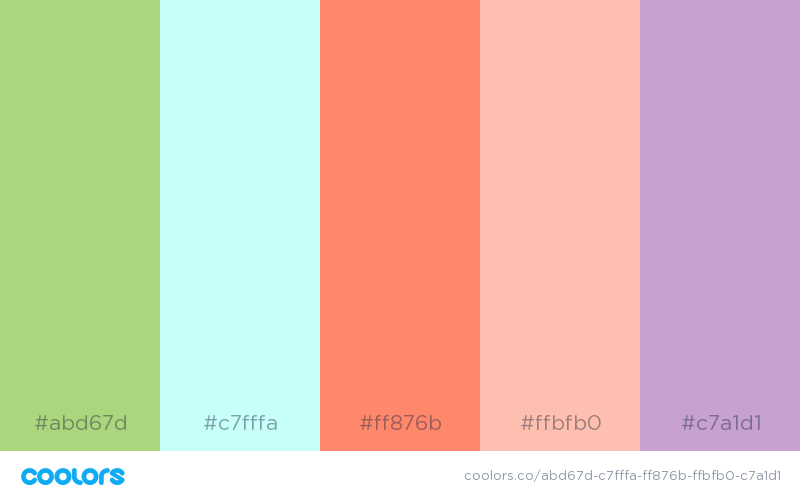 If a designer setup your brand colors via the PMS, ask them to provide you with the swatches. Then, simply add those exact ones to your swatch palette. *Extra notes: Remember, when exporting your PDF for printing, select either the “Press Quality” or “High Quality Print” option under the “General” tab. Also, make sure that you choose “Maximum” image quality under the “Compression” tab. Finally, don’t forget any necessary bleed or crop marks if your design goes off the edges and the document is a certain size that will require trimming. Adobe Photoshop: I create my digital brand graphics (for social media, my blog, etc.) in Photoshop. It may also be easier to use Canva. But, in Photoshop, once you create the image, simply go to “Image” (in the top menu) → then “Mode” and select “RGB Color.” In another instance, if you are formatting an image that is going to be printed for some reason (like a logo on a sign) you would choose “CMYK Color.” Are you getting the hang of it, now?